In most modern Pagan traditions, plants and their folklore are an integral part of belief and practice. In particular, many of the Sabbats are associated with the magical properties of different plants. Yule, the winter solstice, falls around December 20 – 22 in the northern hemisphere, and near June 20 – 22 if you live below the equator. Let’s take a look at Yule, and seven plants that often correspond with the season. You know that big tree you just hauled in from the woods and decorated with lights and ornaments? That’s carrying on a time-honored tradition of bringing the outdoors indoors. Trees like pines, fir, juniper and cedar are all part of the evergreen family, and they’re typically associated with themes of protection and prosperity, as well as that of a continuation of life and renewal – after all, when all of the other trees have lost their leaves and gone dormant for winter, your evergreen family of trees will still be… well, green. If you don’t feel like bringing a full sized tree into your house, that’s okay. Consider utilizing fallen branches to make boughs and swags, or even your own wreath. The added bonus is that most evergreens smell amazing, so you’ll get the scents of the season as well as the look and feel. In many European societies, the holly plant has become representative of the waning sun as the solstice approaches. 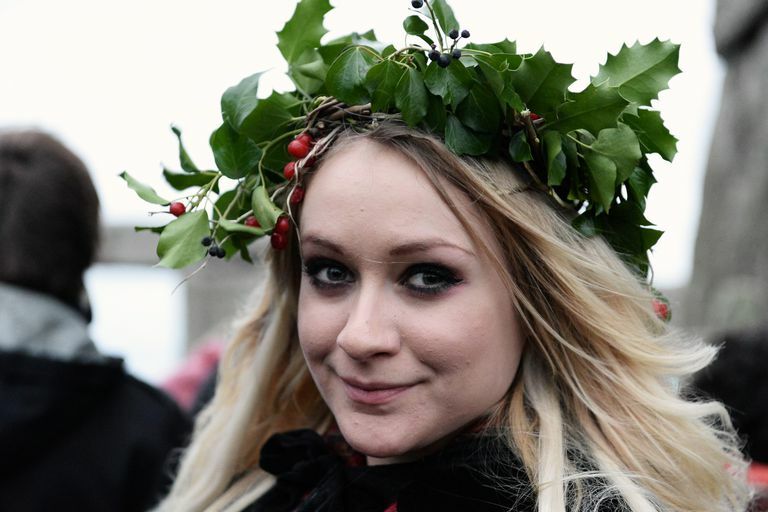 Symbolizing the old solar year, holly is associated with the Holly King himself – a precursor to Santa Claus – who is conquered by the Oak King when Yule rolls around. In the pre-Christian British Isles, the holly was often associated with protection — planting a hedge around your home would keep malevolent spirits out, thanks in no small part to the sharp spikes on the leaves. The ancients used the wood of the holly in the construction of weapons, but also in protective magic. Hang a sprig of holly in your house to ensure good luck and safety to your family. Wear it as a charm, or make holly water (which you probably read as holy water!) by soaking leaves overnight in spring water under a full moon. Add holly branches to boughs, wreaths, and garlands, to bring the Yule season into your home. Remember the old holiday song about the holly and the ivy? Both are an important part of the winter solstice season. Ivy often lives on after its host plant has died; it's a reminder to us that life goes on, in the endless cycle of life, death and rebirth. This is a good time do workings related to improving yourself, and placing a barricade between you and the things that are toxic to you. Ivy can be used in magic performed for healing, protection, cooperation, and to bind lovers together. In addition, ivy is associated with fidelity and loyalty – use it in your Yule decorations to represent the powerful bonds of family and friendship. We’ve all heard of the tradition of kissing under the mistletoe – it’s associated with peacemaking and the end of discord, which is a perfect theme for the winter holidays. The Norsemen laid down their arms if they met beneath a growth of mistletoe — why not use it in a working to end strife and discontent in your life? You can place sprigs of mistletoe around your home and on tabletops in vases and bowls, or even make what’s called a “kissing ball” to hang in the doorway. Mistletoe is associated with several deities, including the Norse Frigga and Baldur, as well as connected to prosperity and fertility. Pliny wrote that Druid elders performed rituals in which they harvested mistletoe — a botanical parasite — from oak trees with golden sickles. It was collected under a waxing moon phase, and then fed to animals to guarantee their fertility. As part of the rite, a pair of white bulls was sacrificed, and if prayers were answered, prosperity would be visited upon the villages. When a forested area burns, birch is often the first tree to grow back, and thus is associated with rebirth and regeneration. Workings using birch can add momentum and a bit of extra "oomph" to new endeavors. The birch is also associated with magic done for creativity and fertility, as well as healing and protection. It is the first month in the Celtic tree calendar, following the winter solstice. Use birch branches to craft your own besom for magical workings, and in spells and rituals related to enchantments, renewal, purification, fresh starts and new beginnings. At the time of the winter solstice, the Oak King defeats the Holly King as we say goodbye to the old solar year. Oaks are a symbol of endurance and power, and although they’ve all dropped their leaves and acorns by the time Yule rolls in, they’re still hardy and strong. Associated with a number of deities – including the mighty Thor himself – the oak tree represents victory and triumph. Rulers often wore crowns of oak leaves, as a symbol of their connection to the divine. After all, if one were a living god, personification of the god on earth, one had to look the part. Roman generals were presented with oak crowns upon returning victorious from battle, and the oak leaf is still used as a symbol of leadership in the military today. As the solar year draws to a close, the yew tree represents the final day. Following the winter solstice, the days will begin to grow long again, but for now, it’s the nights that seem endless. The yew is associated with immortality and longevity, and in many European societies was even seen as giving access to the world beyond our own. In some Wiccan traditions, yew is sacred to the crone aspect of the triple goddess, who makes her appearance in the darker half of the year. When it comes to the yew, the winter solstice is a good time to accept change for what it is — an asset — and stop seeing it as an obstacle. Don't fear new things, choose to embrace them!